The following is a brief history of the family of Joseph William Sidley in Limerick. In 1856 he was working for Revington and Co. Within ten years he had started his own business at 26 George Street (O’Connell Street). 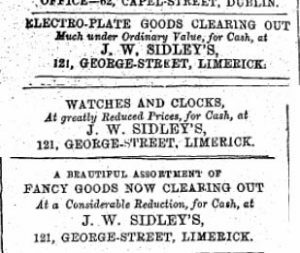 In 26 April 1867 Joseph William Sidley (1826-1895) a jeweller and shopkeepe filed for bankruptcy. Though this did not last long as according to the Henry & Coghlan’s trade directory of 1867, he worked as an Electro Plater. His business also operated as a fancy warehouse, a china, glass and earthenware dealer, a jewellers, an optician, a perfumers, a picture frame makers, a stationers and a watch and clock makers. In 1868, he travelled to London to purchase items for his store so had returned to his feet. By the time of Slater’s trade directory of 1870 he had moved his tore to 121 George Street and the business had been refined to a fancy warehouse, jewellers and silversmith, a perfumers and a watch and clockmaker. His troubles were not all behind him as between 1876 and 1881, Sidley was in court seven times for non-payments of rates. 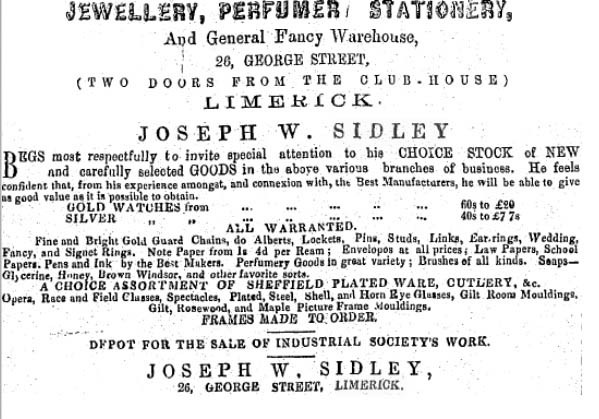 By 1891, Joseph William Sidley had left Limerick and moved permanently to England. On the 15 May 1856 Joseph married Louisa Adams in St Michael’s Church of Ireland Church on Pery Square. Lousia was the eldest daughter of John Adams of H.M. Customs, living at Queen Street (Parnell Street). In 1865, they had a son Joseph Nelson who died soon as an infant. In 1867 they had a daughter Emma. In 1869 they had another daughter Kate who also died in infancy by this time they were living at 121 George Street. In 1870 their daughter Helena Gray was born, followed two years later by Grace. In 1874 their last child a son Francis child was born. By 1891, the Joseph, his wife their children Emma, Grace and Francis were living in Lancashire and his occupation was recorded as a stationer. Joseph died on the 14 February 1895 in 390 Edge Lane, Liverpool he was buried in West Derby cemetery. NextThe first 100 years of Quinlan Street.